Not content to launch a new Cayenne in hybrid form and a stonking 918 hybrid concept at Geneva, Porsche showed a hybrid version of its new GT3R racing car. 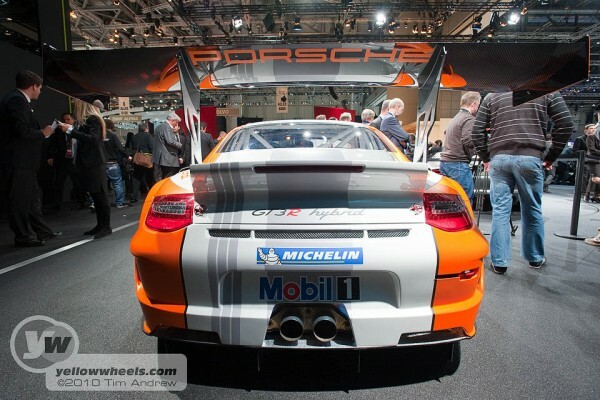 Set to race for real at the Nürburgring, this is no concept but a fully fledged 911 endurance racer. What sets it apart from the competition, particularly in the hybrid sense, is that it runs a flywheel type energy recovery, storage and power plant to supplement the 4 litre flat-six petrol engine engine in the tail rather than a battery pack. So how would you feel about sitting next to what looks like a personal nuclear fusion reactor ? Should be fine really as it’s just a disc spinning at, err, 40,000rpm….but at least it has been developed by Williams Hybrid Power Ltd and Torotrak so does have some F1 technology built in. After its debut in Switzerland, the 911 GT3 R Hybrid will be tested in long-distance races around the Nürburgring, Germany. The highlight of this test programme will be the 24 Hours race around the 14-mile Nürburgring Nordschleife circuit on 15/16 May. However, the focus is not on the 911 GT3 R Hybrid winning the race but rather serving as a spearhead for the technology and a ‘racing laboratory’ that will provide invaluable knowledge and insight on the subsequent use of hybrid technology in road-going Porsche sports cars. The hybrid technology featured in the 911 GT3 R Hybrid has been developed especially for racing, and is set apart from conventional hybrid systems in its configuration and choice of components. Uniquely, an electrical front axle drive with two electric motors each developing 60 kW supplements the familiar 480 hp (353 kW) four-litre flat-six ‘boxer’ petrol engine at the rear of the 911 GT3 R Hybrid. Consequently, the 911 GT3 R Hybrid has four driven wheels, offering even greater traction and agility. A further significant point is that instead of the usual batteries of a conventional hybrid-powered road car, this 911 features an electric flywheel power generator – mounted inside the cockpit beside the driver – that delivers energy to the electric motors on the front axle. The flywheel generator itself is an electric motor – with its rotor capable of spinning at speeds of up to 40,000 rpm – and stores energy mechanically as rotation, or kinetic, energy. The flywheel generator is charged-up whenever the driver applies the brakes, with the two electric motors reversing their function on the front axle and acting themselves as generators. The driver is able to call upon this extra energy from the charged flywheel generator at his command for competitive advantage, such as when accelerating out of a bend or overtaking. The flywheel generator is slowed down electromagnetically in the generator mode and able to supply up to 120 kW to the two electric motors at the front axle from its resource of kinetic energy. This additional power is available to the driver after each charge process for approximately 6 – 8 seconds. Energy formerly converted into heat, and thus wasted, upon every application of the brakes is now converted highly efficiently into additional drive power. 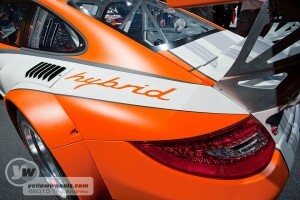 Depending on racing conditions, hybrid drive is used in this case not only for extra power, but also to save fuel. This again increases the efficiency and, accordingly, the performance of the 911 GT3 R Hybrid, by reducing the weight of the fuel tank or making pit stops less frequent, for example. The 911 GT3 R Hybrid is a perfect example of the Porsche Intelligent Performance philosophy, a principle to be found in every Porsche and defined as more power on less fuel, more efficiency and lower CO2 emissions – on the race track and on the road. Already, customers can buy a Porsche 911 coupe with a six-cylinder 345 bhp engine which can return nearly 30mpg Combined and produces just 225 g/km CO2; a feat unrivalled in its performance class and just one example of the application of Porsche Intelligent Performance to maintain outstanding driving dynamics yet lower running costs and environmental impact. Devising smart, individual engineering solutions to combine performance and efficiency with everyday usability is something for which Porsche is renowned, and is evident in such developments as lightweight body construction methods, Porsche Ceramic Composite Brakes (PCCB) and the Porsche Doppelkupplungsgetreibe (PDK) double-clutch gearbox.